Spending time with Sir Donald: visit the Southern Highlands | The International Cricket Hall of Fame. 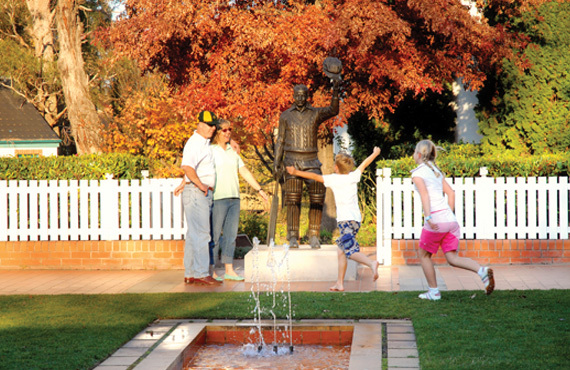 Visit the life-sized statue of Sir Donald Bradman in the courtyard and read the plaque where Sir Donald and Lady Bradman’s ashes are scattered. See The Don’s very first bat, a life sized portrait, hand-written coaching notes and 35mm slides that he used to coach children in the 1940s-1960s. Can you emulate Bradman’s training technique of hitting a ball against a water tank with a stump? Purchase your tickets to Bradman Centre HERE.